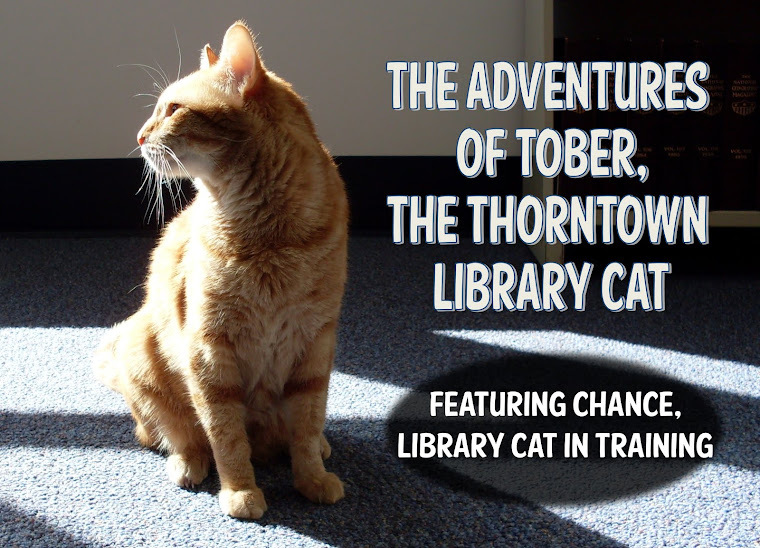 The Adventures of Tober, the Thorntown Library Cat: Bad Cat? I have been told twice this week that I am a Bad Cat! First I was called a Bad Cat because I was chomping on AAB Kathy's computer cord. AAB Christine was borrowing Kathy's desk on Tuesday night, and I kept walking under the desk to chomp the cord. Well, AAB Christine, not being cat-shaped, was unable to get to me, so I could chomp-chomp-chomp to my heart's content. She must've figured I was hungry, so she offered me treats. I came out from under the desk and had two. Then I went back to chomping, so AAB Christine got the treats out again. I had two more, and put some furs on the monitor, and pulled a few hold slips out of AAB Kathy's books. Then I went back under the desk for some chomping. Christine shook the treat-bag again, so I came out to have some, but guess what? She didn't offer me any treats. She went "hrmph" and stuck them in the drawer! I waited very patiently and even stomped on the keyboard a few times, but I didn't get any treats. So I went back to chomping on the cord again. Christine shook the treat-bag, but this time I knew she was Lying to me. I knew I wouldn't get any treats, so I just looked at her for a while. She started hollering my name, and I just purred and purred, because I was under the desk with the tasty cords, and she looked silly on the ground like a Cat (only not so graceful or elegant). So she got two treats out, and I decided I wanted to eat them. 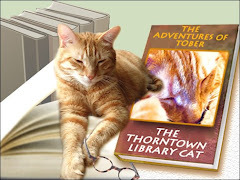 . . at which point she scooped me up, carried me out of the office (closing the door behind her), deposited me on the circulation desk, and declared me a Bad Cat. That would have hurt my feelings, but I was too busy being proud that I have effectively trained my first Staff member to reward me for chewing on cords. At last! What can I say? I got hungry in the middle of the night and I wanted a snack and I don't have thumbs. So I used my Sharp Teeth! I think I should be called a Smart Cat, and maybe the one who left the treats lying around can be henceforth known as Not-So-Smart Human. 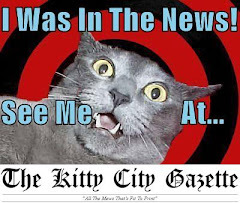 None of this "Bad Cat" business would be going on if AB Karen were here--but she's on Unauthorized Vacation, so I'm having to suffer all sorts of indignities in her absence. Thankfully we will be reunited this weekend, and she'll call me a Good Cat and give me lots of tummy rubs and treats and Catnip. It got a little boring after the apple toss, especially since I already found all the hidden gum-wrappers. Good work Tober! I gotta train my humans to do this treats for cord chewing thing... so pawesome! Of course you are a GOOD good cat, Tober. Keep it up and you'll have staff sufficiently trained soon. Tober, when it comes to humans, "smart" and "bad" seem to mean the same thing! 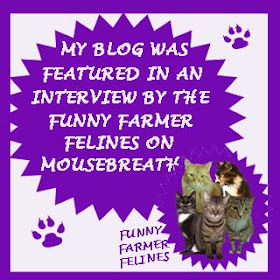 We don't understand why you were called Bad Cat, Tober! You were just doing what comes naturally!! I am totally shocked at your staff's rudeness calling you, Sweet Tober, a bad cat! I really don't even know how to speak about this event except to say, that people who called you bad should be ASHAMED OF THEMSELVES! I love how they left the treat bag out and you broke into it! How fun, but my Mum would never leave it out. My Mum did get a little short with me tonight as she was trying to hook up a new DVD player and I was attempting to help her. I don't know why I'd help her because she never gets any movies about cats as interesting as that would be. We liked your movie, Tober, and wish we were closer. You are certainly keeping yourself (and everyone else) busy around there! That's how to train a human! Bad cat hmpf! There is no such thing! Mischieviuos, yes, bad, no. They do know there areways to cover those cords,don't they? You ARE a good cat, Tober, and don't let them tell you otherwise! Have a great weekend!